Our Fabulous 5: Easter Edition - Activity Packs, Children Activity Packs & Kids Colouring Packs - Packme Ltd.
Make this Easter extra special for the kids! The perfect place to dine for the whole family. Tom’s Kitchen is a popular choice for families on weekends and we can definitely see why! Kids can dine for free (up to the age of 10) if they are accompanied by 1 full paying adult and order from the brunch or main course menu. This fantastic deal is also available on Bank Holidays, Saturdays & Sundays between 10am — 4pm. Tom’s Kitchen also have some fabulous kids packs & activity sheets (check them out here). Child friendly & dog friendly! Blue Crush in Scarborough have a delicious & varied children’s menu available, from as little as £4.95. Fancy winning some exclusive TGI Fridays badges? Keep reading! 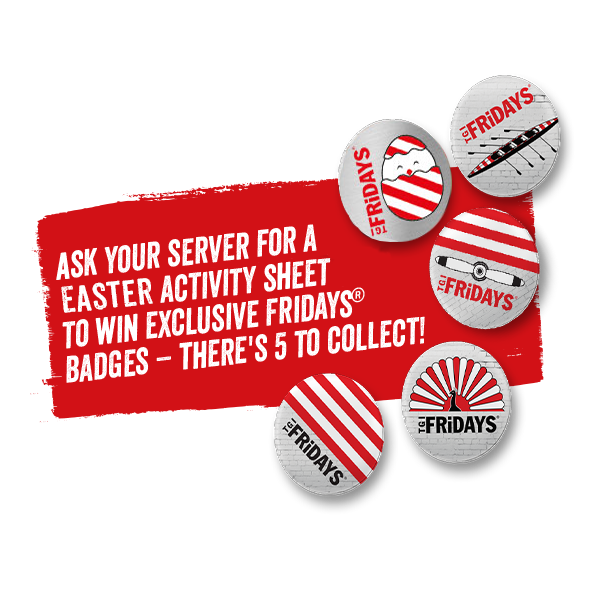 During this Easter holiday, kids have the opportunity to win TGI Fridays badges in store. How? The chain will be giving out themed Easter colouring sheets #ProducedByPackme. There are five different badges up for grabs – are your kids ready for a challenge? How: Head down to TGI Fridays & ask for their Easter themed activity sheets, your server will explain to how to win the badges. Tomorrows fish are still in the sea! The Rockfish is ideal for families along the seafood coast, kids can choose from 6 delicious mains, a side & a dessert for £6.95. This price includes a free children's activity pack, which we have to say is pretty amazing! Bella Italia’s kids menu starts from just £5.95; this includes a three-course meal + the chance to win a holiday (worth £5000) with Paddington 2! There’s something for the whole family to enjoy, adults get 40% off their Mains too!